Kosmos gives geopolitical arguments to operate in occupied Western Sahara, while Cairn Energy refuses to answer why it operates in what they call “Morocco”. WSRW has sought clarifications from the duo. This entry was posted in Oil and gas exploration, Political issues on July 28, 2016 by appleton. This entry was posted in General, Political issues on July 24, 2016 by appleton. ALGIERS, July 9 (Reuters) – Western Sahara’s Polisario independence movement has elected a former ambassador to Algeria, Brahim Ghali, as its new leader after the death of its chief, Mohammed Abdelaziz, who led the front through a war with Morocco and years of diplomatic struggle for self-determination. Abdelaziz died in May aged 68 after more than three decades as leader of the Sahrawi Polisario Front and president of its self-declared Sahrawi Republic, with its base in southern Algeria since a ceasefire in 1991. In recent months, several investment firms have relinquished their interests in companies that are involved in the natural resource exploitation of occupied Western Sahara. Ever more investors are leaving the small handful of the companies that take part in the exploration, exploitation and purchase of non-renewable resources. Details of 21 such companies are provided in this article. This entry was posted in Fisheries exploitation, Oil and gas exploration, Phosphate importation, Political issues on July 24, 2016 by appleton. Norway’s sovereign wealth fund has announced it has excluded Kosmos Energy and Cairn Energy from its portfolios because of their oil search in Western Sahara. Approx. 54 million dollars of shares were sold. 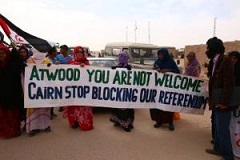 “The Council recommends the exclusion (of Cairn and Kosmos)… due to an unacceptable risk of the companies contributing to serious violations of fundamental ethical norms through their hydrocarbon exploration offshore Western Sahara,” the council said. This entry was posted in Oil and gas exploration on July 24, 2016 by appleton.